Does this picture look like the inside of YOUR chimney? You’re not alone… Most fireplace owners admit to neglecting to take care of the inside of their chimney (or even remembering to have it checked regularly)! Your chimney, and the flue that lines it, adds an architectural attraction to your home, but its’ real function is to carry dangerous flue gasses from your fireplace or wood stove safely out of your house. A chimney helps the air in your home stay breathable. Determine if chimney needs to be cleaned. 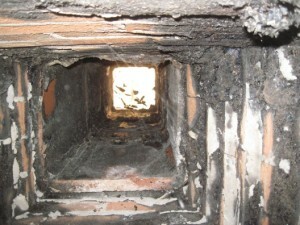 Chimneys should be cleaned at least once a year, and more often if you use your fireplace frequently. You need to obtain a solid view of the inside of the chimney using a bright flashlight or industrial spot light. Check the chimney for animals. If it has been awhile since the last time you used your chimney, check for critters before you begin cleaning. Measure your chimney flue. To clean your chimney, you’ll have to use properly-sized tools. You can measure the sides of your chimney from the bottom, through the fireplace… Or you could climb up a ladder and measure it from the top. Buy chimney cleaning supplies. Go to the hardware store and buy the necessary items to prepare for cleaning the chimney. Dress in appropriate clothing. Wear old clothes that you don’t mind getting messy with soot or torn up. Prepare your house for the cleaning of your chimney. Drape drop cloth or tarp around your fireplace, extending it out into your living room several feet to avoid getting other things dirty. Remove the damper from the chimney flue. Locate the damper handle inside of your chimney, and use a small wire brush to clean it off. These are just the first parts of the steps…you will need to learn more about properly accomplishing each of these steps, and obtaining the correct items to do so. You could just take the “One-Step Approach” – which is to call certified experts (First Choice Chimney) who can take care of ALL of these steps for you, and even further ensure a safer, cleaner and more “breathable” living environment for you and your family. Either way, we encourage you to take the proper steps to check and correctly clean your chimney and fireplace, so your home and family remain safe!